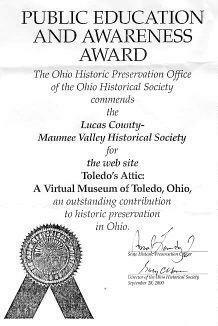 Toledo’s Attic is a joint project between the University of Toledo, the Toledo Lucas County Public Library, the Lucas County-Maumee Valley Historical Society, and WGTE-TV Public Broadcasting. It features virtual exhibits on various aspects of Toledo’s rich history, with a special emphasis on the history of the twentieth century. Although all of Toledo's Attics exhibits are based upon extensive research by experts in the field, the audience targeted includes all of Toledo and anyone who would like to study the history of Toledo. The Attic welcomes feedback from visitors about the site and its exhibits. Our mission, as stated in our annual report of 2000, “continues to be to identify and publicly display artifacts and other evidence that help to reconstruct, interpret, and commemorate the story of twentieth century Toledo and its surrounding communities; to develop inter-generational interest, appreciation and respect for our unique heritage; facilitate the on-going identification, acquisition, preservation, and exhibition of archives, artifacts, oral histories, and sites." 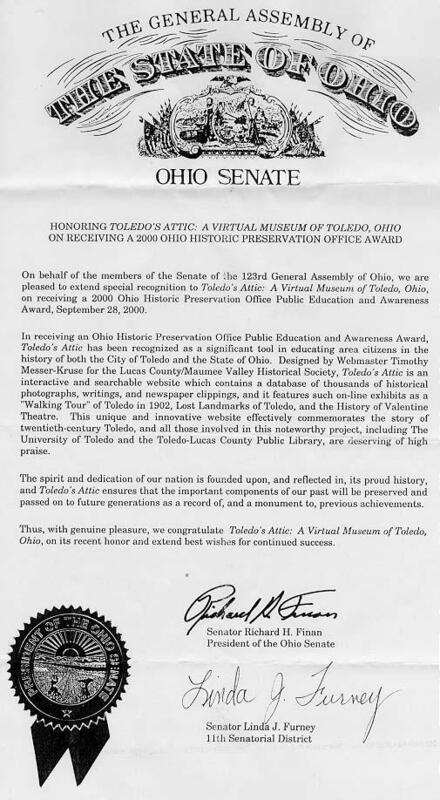 In 2002 Toledo's Attic was awarded the Ohio Historic Preservation Office Award from the State of Ohio. In 2007, Toledo's Attic was once again producing new exhibits, and in 2009, when new technologies became available, it was migrated to WGTE's New Media System as part of a beta testing program. The current plan to migrate Toledo's Attic yet again to a more robust platform reflects the new opportunities afforded by open-source software, social networking, and the opportunities to engage with the digital history crowd. In fact, Toledo's Attic has been a digital history project since the outset, and access to various technologies (including mobile devices) means that visitors will be able to access reliable historical information in real time. Toledo’s Attic grew out of a desire to have an online museum dedicated to the history of Toledo and Northwest Ohio in the twentieth century, particularly the area’s rich industrial history. While the Maumee Valley Historical Society is recognized as the premier source for information on the eighteenth and nineteenth century history of the region, it was felt little had been done to promote the history of the recent past. The project began in 1995 with the creation of a steering committee dedicated to promoting recent local history. This committee, through a series of discussions with local history and archival specialists, came to the conclusion that a free standing museum dedicated to Toledo’s industrial, social, governmental, and cultural history was beyond the realm of possibility given funding limitations. Instead, the steering committee centered its efforts on creating a virtual museum that would feature exhibits made available via the then-new medium of the World Wide Web. Dr. Timothy Messer-Kruse, then of the University of Toledo Department of History, began the task of developing the web site with funding provided by the Ohio Humanities Council, the Miniger Foundation, and the Stranahan Foundation. The site was envisioned as a way to display historical photographs, documents, and artifacts with text that would link the items together as full-fledged topical exhibits. The site was officially launched in 1999, and was hosted by the University of Toledo Department of History through funding provided by the university and grants administered by the Maumee Valley Historical Society and the Miniger Foundation. During its existence, the site has been the subject of television and print news coverage due to the unique nature of its exhibits and delivery medium. By 2003, Dr. Messer-Kruse was no longer able to supervise the web site and the steering committee began looking for alternatives to host the site and manage the context. In 2004, WGTE-TV generously agreed to develop and support a new site for Toledo’s Attic, with the staff of the University of Toledo’s Ward M. Canaday Center for Special Collections assuming the role of managing the content. Today, Toledo’s Attic continues to build upon past successes. Thanks to the dedication of the staff who operate it, Toledo’s Attic has become a useful and necessary tool for educating citizens about Toledo's and Northwest Ohio’s rich twentieth-century history in the twenty-first century.